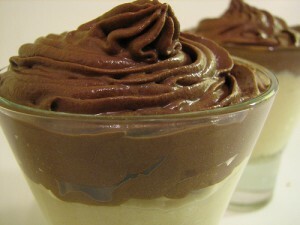 Chocolate Banana Mousse recipe by bestchefs at DesiRecipes.com. Place the chocolate in a pan, add 1 tablespoon of cream and melt it over gentle heat till it becomes a smooth sauce. In another bowl, whisk the cream and vanilla essence till it get soft. Keep aside. Pour the melted chocolate over the mashed banana and mix well till it is cool. Slowly fold in the whipped cream, pour into 2 individual glasses and refrigerate till it sets.